My favourite craft at the minute has to be crochet. I find it a lot quicker than knitting but it’s also more challenging. There are lots of different stitches to learn, unlike knitting where you’ve only got knit and purl. A crochet technique I keep seeing images online for is corner to corner crochet blankets. These are detailed, pictorial blankets that look amazing, but also really tricky. 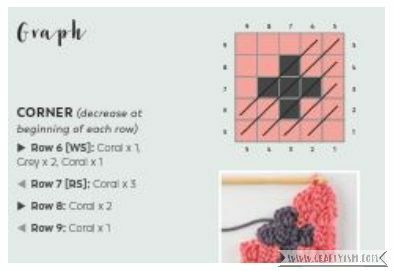 So when I got the chance to read Corner to Corner Crochet: 15 Contemporary C2C projects by Jess Coppom I was excited to learn about this mysterious new technique! Corner to Corner Crochet starts at the very beginning. I learnt that the patterns are made up from graphs with each square being a cluster of stitches. The graphs are read starting from the bottom right corner and then each row is worked diagonally. As the patterns use at least two colours, there’s hints on how to work with multiple strands of yarn. There are also really clear, illustrated instructions on how to increase and decrease the number of squares. 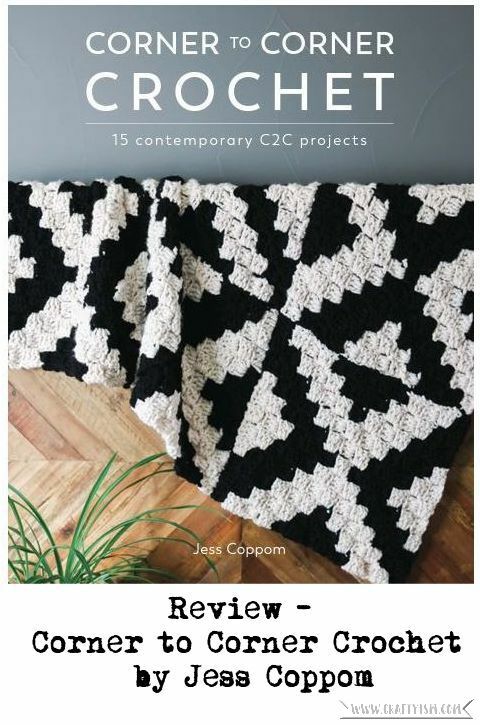 Jess Coppom has designed 15 patterns for Corner to Corner Crochet and I really love them all! There’s modern baby blankets and a chunky monochrome throw. 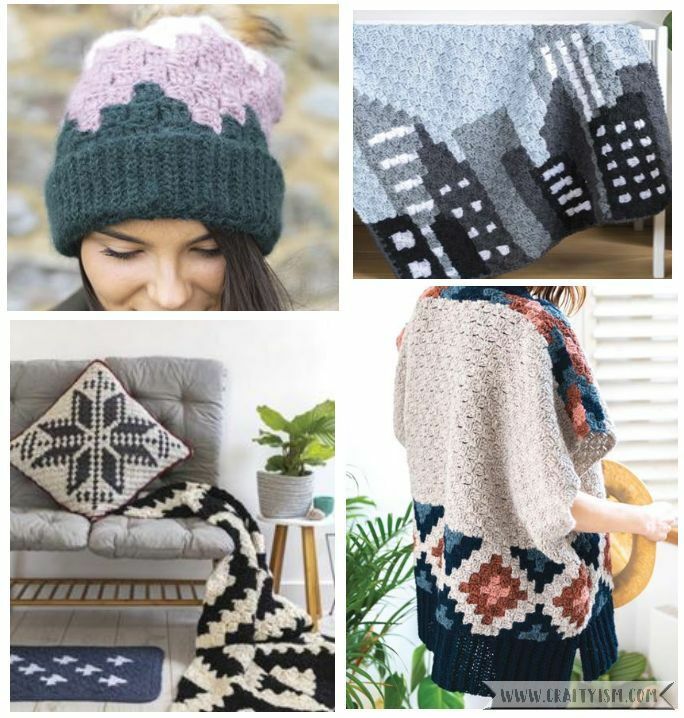 The inclusion of a hat and two poncho/shawls is something that I like, as wearable items are not often included in beginner books. As expected the patterns range from beginner to complex, but all have a star rating so you know what you’re getting into! As I’ve never tried corner to corner crocheting before, I decided to start small. I worked up the sample graph using some scrap DK yarn that I had. I found that each square is made up of 4 treble crochet stitches. Once I got the hang of how to increase the number of squares for each row, it went pretty quickly. The instructions were so clear that I quickly got the hang of the technique. I do think I need to work on my colour changing though! After testing this small square, I feel well prepared to tackle a larger project in Corner to Corner Crochet. I’ve wanted to try this crochet technique for a while now, and Corner to Corner Crochet by Jess Coppom is a brilliant introduction. The only problem I found in the book is that it’s written in US crochet terms. As a UK crochet-er, this can be a bit confusing! However, the conversions are explained in the back of the book. I love that there is an explanation of how to make your own graphs. Designing my own crochet patterns is something I would love to do! Looking at the graphs makes me think how similar they are to cross stitch charts. It would be interesting to see if a cross stitch chart could be used in corner to corner crochet. Overall I highly rate Corner to Corner Crochet by Jess Coppom. The patterns are modern and useable, and the instructions are well written. If you’re looking to learn a new crochet technique, then definitely give this book a try!